This is going to be an interesting post for the people who are interested in pallet work. This is super simple project and almost cost nothing I mean to say that the amount is negligible. I will share now to all of you about my wood pallet map project. I had some spare pallets at home that I had collected from an industrial auction for future without paying any penny. I had already taken out all the nails from the pallet planks holding them together. You need to put little more effort to take out all the nails from the pallets. The next thing that I did was to sand the pallets to get rid of rough spots of each pallet plank. You should have enough planks so that you could properly display your map. You have to be carefully while doing this project even a small mistake can cause serious consequences for you in terms of completing this project easily. I connected the pallet planks with the piece of plywood and then glued them into place. It is so easy to find the required map in 1$ for many different styles. You can cut it randomly to give it a worn look without clear edges so that they go well with the pallets. I also burnt the edges of the map but if you do this be careful in doing so. You can also see that I have burnt the empty spaces in the map to create holes. The overall look of the wood pallet map will be very much classy. 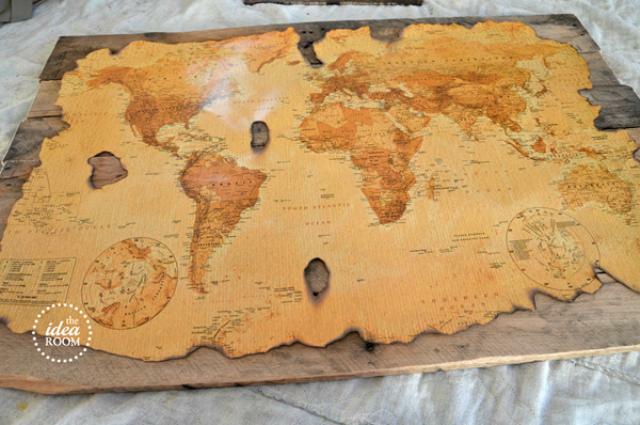 What I have done to the map is to cut and paste on each separate plank which is also visible in the pictures and also left small places in the map. Finally you can put few coats of polyurethane to finish the project.